Geboren 1928 in Salzburg als Sohn des Kemptener Chordirektors und Musikwissenschaftlers Dr. Lehrndorfer. Meisterklassendiplom im Fach Orgel (1952), gewann 1957 den ersten Preis des internationalen ARD-Musik-Wettbewerbs. Seit 1969 Domorganist der Münchner Frauenkirche, Leiter des Fachbereichs katholische Kirchenmusik und Orgel und Liturgie an der Münchner Musikhochschule (1969-1993). Weltberühmt durch seine Orgelkonzerte und hohe Kunst der Improvisation. What springs to most people's minds when they hear the word organ is the electronic instrument widely used in pop music as opposed to the original pipe organ. And as far as the pipe organ's concerned, we are used to hearing pieces by Bach or Reger being played on it and associate it with churches, cathedrals and classical music. Thus, when Franz Lehrndorfer, an internationally renowned performer of both classical and modern musical literature, plays the traditional organ in an unusual fashion here, then he is probably the first musician to show us that the wealth of color this "queen of instruments" has to offer lends itself equally to themes of an entertaining and lighthearted nature common to wellknown songs. In comparison to other themes, children's songs by their very nature are short and simple in harmony, and as such less suited to large scale renditions. Hence Lehrndorfer has chosen the classical form of the variation to express the various aspects and moods of a song, whether it be the dance of the peasants and of the be-ba-bootsyman, the flight of the fox from the hunter in pursuit, or the twittering of birds in the wood in Cuckoo. The listener experiences almost in passing exemplary techniques of improvisation and movement, coupled with a timelesslycontemporary harmony appropriate to the songs. The Matchsticks variation is a largescale rendition. The theme which often just shimmers through in skeletal form is the starting point for moods and atmospheres that are conveyed in rhapsodic fashion. 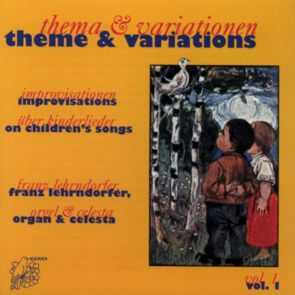 Says Lehrndorfer, "Embarking on new territory in my youth, I discovered a propensity towards inventing new, free variations of wellknown songs." For him improvisation means relying on spontaneous inspiration. There are no sketches or set plans for any of his improvisations in concerts or recordings; sometimes a theme once previously heard makes a brief reappearance but it is then developed completedly differently. The joy of improvising and being free to explore the range of options was the primary factor leading to this recording's conception. Its charm lies in the immediacy of the experiment and the personal enjoyment of certain uses of register or unexpected turns in the music. Franz Lehrndorfer was born in Salzburg, Austria, and grew up in Bavaria. He received his early musical education from his father, a musicologist and choir leader. In 1957, he proved his mastery of the organ when he won first prize at the international ARD Competition sponsored by the German broadcasting network. In 1969 Lehrndorfer was appointed organist of the Munich Cathedral, the same year he became head of the Department of Organ and Catholic Liturgical Music at the Munich Conservatory. His renown and the resulting demand for his services as a teacher led him to found a School of Organ in Munich, which has since produced two generations of graduates. More than a few names well-known to the music world may be counted among them. Lehrndorfer is a recognized master of the art of improvisation. His concerts both in Germany and abroad are invariably met with enthusiasm and admiration, and many of his performances have been preserved in recordings, including Celestial Christmas 5 (13090), The Concert (13109) and Bach Reger (14200). As Dome Organist for over 30 years and as a visiting professor at the Catholic University in Porto, Portugal, Lehrndorfer has carried on a tradition of organ recitals initiated by his predecessors and has expanded their scope. Wellknown contemporary composers write works for him to premiere. 1 Im Märzen der Bauer 3'33"
2 Ein Männlein steht im Walde 8'40"
3 Fuchs, du hast die Gans gestohlen 5'11"
8 Schlaf, Kindlein, schlaf 4'56"